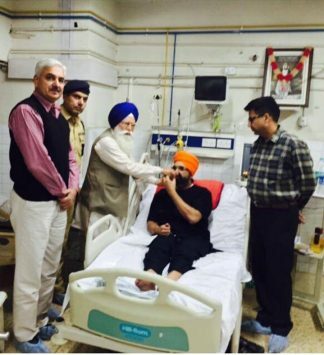 PATIALA, Punjab—Newly appointed President of Shiromani Gurdwara Parbandhik Committee Prof. Kirpal Singh Badungar met with death row convict Bhai Balwant Singh Rajoana at the Rajindra Hospital (Patiala) in the evening hours of November 9. Bhai Balwant Singh Rajoana was admitted here after he announced to go on indefinite hunger strike to seek clarity over his death penalty. After meeting with Prof. Badungar, Bhai Balwant Singh Rajoana announced to end his hunger strike. Talking to @unitedsikhnews, Bibi Kamaldeep Kaur Rajoana (foster sister of Bhai Balwant Singh Rajoana) announced that SGPC President Prof. Kirpal Singh Badungar assured Bhai Rajoana in writing, a follow up to the legal proceedings of the mercy petition filed before President of India. Notably, the SGPC had moved a mercy petition for death row convict Bhai Rajoana before President of India in March 2012 when his execution date was fixed March 31, 2012 by the Court. “I spoke with(Bhai Rajoana) and he informed me about ending hunger strike. He was satisfied by assurances by Prof. Badungar,” she added. She told Sikh24 that Bhai Rajoana had told over 11 kgs after starting hunger strike. “SGPC will form a panel within the next week which will take up the legal matter,” she said. Bhai Balwant Singh Rajoana had started indefinite hunger strike on November 3 against unnecessary delay in his execution. In a letter addressed to Sikh masses, Bhai Rajoana had slammed SGPC for moving the petition before President of India without his consent. He had accused the religious leaders of boot-licking politicians for their vested interests.